To become an Authorized Reseller, you must first have an Authorized Consultant on staff and you must maintain at least one Authorized Consultant in your organization. Authorized Resellers earn a margin on the license fee that is actually charged. This takes into consideration that license fees may be negotiated. No territory limitation exists, but the number of Authorized Resellers based in a particular area is limited. A member of the Carillon ERP management team must be given an opportunity to meet with the potential client, in person, prior to closing the deal. This will typically be done at Carillon ERP’s expense. This helps assure the product has been properly represented and that it is likely that the client’s expectations will be met. Authorized Resellers are expected to close at least one deal per calendar year to maintain their status. 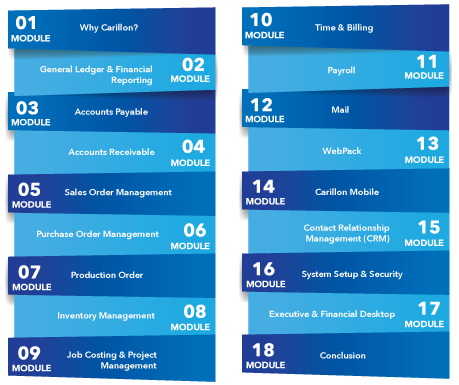 Carillon ERP management must approve the amount of negotiated license fees. This is usually just a formality but it protects Carillon from an unscrupulous reseller charging excessively for services while drastically reducing the license fee. Here is a standard listing of the topics covered. Although your seminar may cover all of these topics, the trainers attempt to create the schedule based on the attendees’ interests. If you have any specific requests, please let us know prior to your training so we can schedule your topics into the seminar. Multiple modules will be covered each day.